A STEM CELLS report in 2006 established that infusions of bone marrow cells improved liver fibrosis and induced liver regeneration, leading to applications in experimental clinical trials for cirrhosis . However, multiple questions remain unanswered, including those regarding the exact nature of the cell (or cells) with the greatest regenerative potential and the mechanisms involved. While mesenchymal stem cells (MSC) and macrophages play different functional roles, both cells types display promise in the treatment of cirrhosis. Alternatively activated M2 macrophages reduce inflammation and promote fibrosis regression following liver injury stabilization  and colony‐stimulating factor‐1-stimulated macrophages induce fibrosis regression in mice . Meanwhile, around 50 clinical trials have employed MSC therapy to target both chronic and acute liver disease. In their recent STEM CELLS Translational Medicine article, researchers from the laboratories of Atsunori Tsuchiya and Shuji Terai (Niigata University, Japan) assessed the potential of a synergistic combination of MSCs and stimulated macrophages to treat liver cirrhosis . While Watanabe et al. demonstrate that this cell combination reduces liver fibrosis and enhances liver function, the authors also tracked administered cells in the liver by intravital imaging with two‐photon excitation microscopy  to delineate the regenerative mechanisms involved and thereby promote the development of new treatment approaches. Initial in vitro coculture assays discovered that MSCs polarized stimulated macrophages towards an M2 phenotype with high phagocytic activity via the secretion of Prostaglandin E2 and Tumor necrosis factor-inducible gene 6 protein, suggesting an indirect role for MSCs and a possible synergism between the two cell types. Subsequent In vivo assessments in a carbon tetrachloride‐induced mouse model of cirrhosis highlighted the ability of the MSC-stimulated macrophage combination to reduced liver fibrosis, increase hepatocyte proliferation, and reduce blood levels of liver enzymes more effectively than MSCs or stimulated macrophages alone. Interestingly, intravital-imaging analysis following the administration of MSCs and stimulated macrophages revealed the mass migration of stimulated macrophages, but the rare migration of MSCs, to the fibrotic area in the affected liver. Once in the liver, administered cells joined with infiltrating host macrophages and neutrophils in reducing liver fibrosis and promoting liver regeneration. 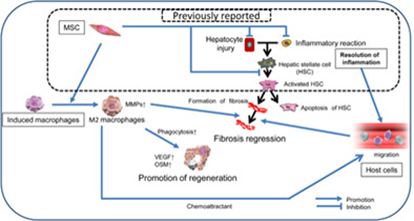 Again, this suggests that MSCs affect fibrosis and liver regeneration indirectly, while stimulated macrophages play a more active role in phagocytosing hepatocyte debris in the fibrotic region following engraftment. While the authors do note some limitations to their study, including differences between human disease and the mouse model employed, and the lack of direct injection of the cell combination into the liver, their data does highlight MSCs and activated macrophages as a potent cell combination that promotes liver fibrosis regression and liver regeneration, thereby representing a potentially efficient treatment for cirrhosis. For more on potent cell combination treatments to reverse cirrhosis-associated fibrosis and lost liver functionality, stay tuned to the Stem Cells Portal! Can additional cell-types further enhance the MSC/macrophage combination? What is the therapeutic effect of MSC-polarized macrophages when transplanted alone; do we need to transplant MSCs? Given knowledge on the possible factors involved, can macrophages be polarized without the need for MSCs and used alone? Can this potent combination be applied as a therapeutic approach in other diseases/disorders? Terai S, Ishikawa T, Omori K, et al., Improved Liver Function in Patients with Liver Cirrhosis After Autologous Bone Marrow Cell Infusion Therapy. STEM CELLS 2006;24:2292-2298. Duffield JS, Forbes SJ, Constandinou CM, et al., Selective depletion of macrophages reveals distinct, opposing roles during liver injury and repair. The Journal of Clinical Investigation 2005;115:56-65. Thomas JA, Pope C, Wojtacha D, et al., Macrophage therapy for murine liver fibrosis recruits host effector cells improving fibrosis, regeneration, and function. Hepatology 2011;53:2003-2015. Watanabe Y, Tsuchiya A, Seino S, et al., Mesenchymal Stem Cells and Induced Bone Marrow-Derived Macrophages Synergistically Improve Liver Fibrosis in Mice. STEM CELLS Translational Medicine 2019;8:271-284. Stoll S, Dynamic Imaging of T Cell-Dendritic Cell Interactions in Lymph Nodes. Science 2002;296:1873-1876.